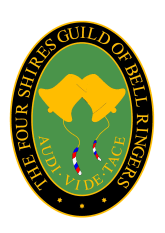 The Four Shires Guild of Bell Ringers was formed in 1909 to cater for all the isolated towers in the Counties of Oxford, Gloucester, Worcester, and Warwick. The man chiefly responsible for the formation of the Guild was Walter Large, a stonemason by trade, who early in 1909 moved from his native Burford, where he had achieved recognition as a bell ringer of some merit, to the village of Todenham near Moreton in Marsh. He soon surrounded himself with a capable and enthusiastic band, many of whom he taught, and it was the keenness of these ringers that prompted the calling of a meeting to discuss the formation of a guild in that area. In 2009 the Guild celebrated its Centenary and is continuing to support the original goal to encourage the art of bell ringing . The Four Shires Guild is not a territorial society but its activities take place in the general area shown on this map. The management of the Four Shires Guild is the responsibility on the Officers and Committee Members that are elected by the members of the Guild. The Guild awards a number of trophies, take a look at the competition details to see what the trophies are and the rules that apply.